You want the optimum CT system-one that works hard for you, but makes your life easier. 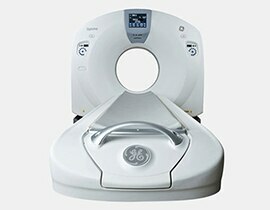 A scanner that helps you minimize dose while delivering diagnostic image quality. That helps to deliver highly competent, personalized care in an efficient and effective manner. And meets the needs of patients young and old, large and small, across a wide spectrum of procedures. All in a compact footprint that fits today's space and budget, and can expand for tomorrow's needs. Now, you can have it all with the GoldSeal Optima CT660.